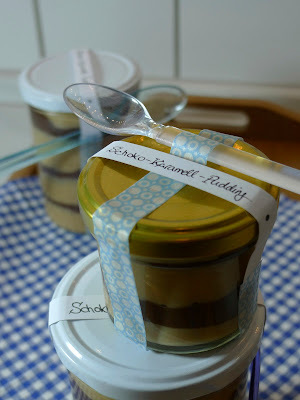 The story of the Kronenkrakker cake is a long one: I once had a colleague who was married to a Finn, and on the occasion of our first joint cookie baking with colleagues she told me about a Finnish pastry called "Korvapuusti" ("slap"). In this context, I asked her if she had ever heard of a Swedish cake called Kronenkrakker. She said no, even when I told her that it was a wedding cake in the shape of seven stacked rings, hence the "crown" in their name, and that these rings were externally decorated with brittle and brittle is called "krakker" in Swedish (actually "brittle" is called "krokant" in Swedish, just like in German and I still don't speak Swedish). I did what every computer scientist would do, and googled "kronenkrakker" for the first time. Zero results. I was confused, I could not remember who told me about the cake, and I thought I had seen it somewhere on the internet - but the Internet also did not know it! Shortly thereafter, at a conference, I asked a few Swedish colleagues about the cake, and again, nobody had heard of either the name nor of the form described by me with the seven stacked rings. I was at a loss. Having had a little time to meditate about it, I remembered vaguely that I had once had a funny dream in which I was an au pair in Sweden, had fallen in love there with a typical blond Swede, and we wanted to get married. So I went to a Swedish supermarket to buy the seven ring molds for the Kronenkrakker cake for our wedding with his mother, a very charming woman, and then I must have woken up at some point. I could not even remember the name of the face of my Swedish dream fiancé, but the cake stuck (which indeed says a lot about me ;-)). 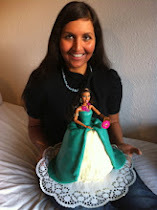 My friend Andrea has asked me to help her bake a wedding cake for her sister Judith. I have known the two sisters since my childhood, because we grew up in the same street, and had a lot of fun thinking up a cake together with Andrea. We thought that a "Donauwelle" ("wave of the Danube") would be a great cake for a wedding in Swabia, and decorated it in the wedding colors red and white. The cake decorations are made from gelatin fondant, which Andrea has modeled herself - she had even practiced with play dough ;-) By now, the happy couple got married - Congratulations and have a happy future together, Judith & Jürgen! 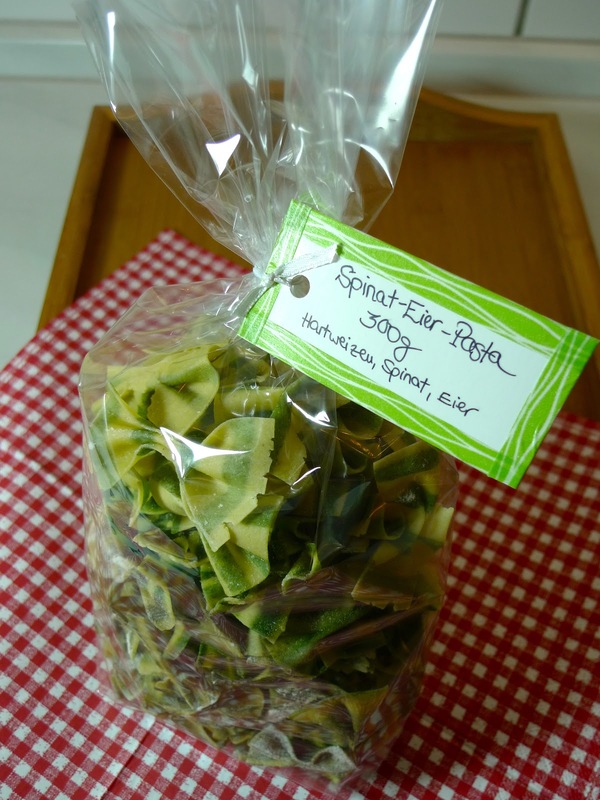 I think homemade pasta makes a great gift, especially the colorful and patterned examples - if you can preserve them well, which means to dry them! 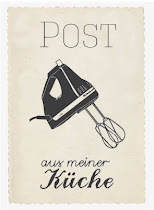 I've tried a lot in this regard, by browsing various Chefkoch.de forums, which was a lot of fun. Since I've finally become the proud owner of a KitchenAid, I had to benchmark it, specifically with green pasta dough, the dough that I least like kneading by hand, and the main reason why I need a food processor! Unfortunately, Kitty didn't deal too well with this first dough, in fact, I had to send her in for repair after only one week's use because the head kept raised during kneading (yes, I bought it just because of the design and I'm still not quite convinced that a much cheaper and only a bit uglier Kenwood wouldn't have been the better choice ... But she's just so pretty and blue :-)). I mostly use this recipe with eggs - on the first try with spinach dough, I used another recipe, and the dough was far too soft, so I had to add tons of semolina. One really should use less eggs to compensate for the spinach. If you want to dry the pasta, it's best not to put salt in the pasta, because it attracts water. However, I have also dried leftover pasta dough including salt without problems! After my faith in my macaron arts had been restored with the Heart Macarons, I had the idea to bake Easter egg macarons for #PamK. 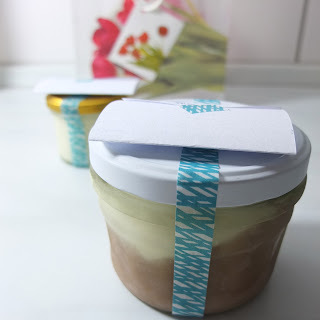 The motto was actually "childhood memories", but my exchange partner lives in a place called "Osterhofen" and together with the date of the exchange, I absolutely had to bake one Easter-themed item! Macarons without food coloring are eggshell colored anyway and colored sugar beads had already worked well on the Snowman Macarons. This time, I were folded the batter probably not quite long enough, the macarons weren't entirely smooth on the surface ... but better like that than if they break during baking!